Thailand | The Adventures of AdventuRoj! Yes! An adventure cooking soon, only here at Adventuroj! Courtesy of yet another Cebu Pacific Air Seat Sale, I and my travel bud are able to book a budget flight to these 3 destinations. No need to get excited yet, but here I am blabbering about it like a kid wanting that piece of lollipop. The trip’s not set until next year, on Independence Day: June 12- June 21 [Best way to celebrate freedom! 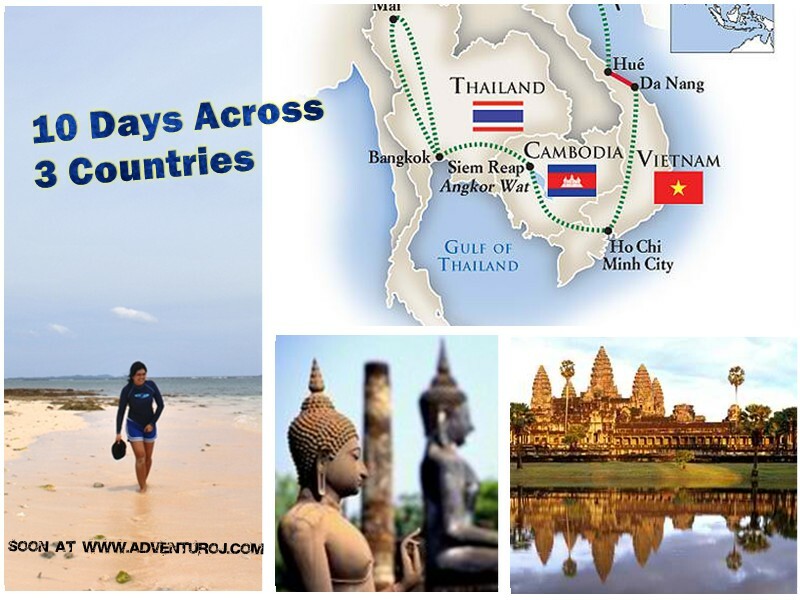 ], we will be embarking on a 10 day – 3 country tour in Southeast Asia. The start of my dreams in fulfillment. 10 Days Across 3 Countries: An adventure cooking soon at Adventuroj.com! Watch out! We’ll leave Philippines for Vietnam, via Cebu Pacific. The flight will leave around 10:50 PM and will take about 2 1/2 hours. We’ll arrive in Ho Chi Minh at around 00:20, local time, with enough time to sleep at the airport? haha. Talk about saving! Then, at 7AM we’ll go on a tour. We’re still choosing between a City Tour, Cu Chi Tunnel Tour or the Mekong Delta Tour. For Cu Chi Tunnel and Mekong Delta, lunch will be included in the tour. If it’s the city tour, the best place for lunch is inside Ben Than Market. For dinner, we’ll head to Tricolore Restaurant along Pam Ngu Lao, where they serve both Vietnamese and Italian food. We’ll take the first bus to Cambodia on the third day. We’ll leave HCMC at around 6AM for a 6-hour bus ride to Phnom Phen. Brunch will be along way, on one of the stops. We’ll arrive in Phnom Phen around lunch time, check in at the hotel and head for lunch. Then, we’ll visit the Tuol Sleng Genocide Museum. Dinner will be in one of the local restaurants. We’ll have breakfast at the hotel, then take the first bus to Siem Reap. We’ll leave around 7AM and the trip would take about 5 hours. We’ll arrive in Siem Reap around noon, check in at the hotel then head off for lunch. After lunch, we’ll visit the Angkor Wat Museum. We’ll take a stroll along the river, then maybe have some fish spa/massage. Just before sunset, we’ll head off to Angkor Wat. Then end the day with a dinner in one of the nice restaurants in Pub Street. We’ll have an early breakfast and spend the entire day visiting Angkor and all the other temples. We’ll go on a city tour and then have a relaxing day. We’ll have dinner in one of the local restaurants near the old market, or maybe in the open market stalls. Start the day early to head off to Bangkok for a 7 hour bus ride. We’ll arrive in Bangkok at around 4PM, and check in at a budget hostel. Tour the city until dinner time. We’ll go on a floating market tour in the morning, in Damnoen Saduak. In the afternoon, we’ll go on a some sites in the city tour. We’ll go on a tour to Kanchanaburi for the Death Railway and Elephant Sanctuary. We’ll catch our flight back to the Philippines. So are you excited? Got any additional travel tips? Suggestions? Feel free to do so!